At the Northwest Lumber Association’s annual Expo in January, LBM Advantage, Inc. was honored as a 2019 Association Supporter of the Year for participation in several of the association’s events and functions. 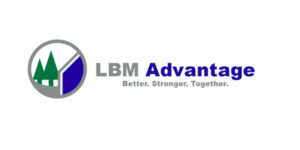 LBM Advantage was also recognized for “their creative way to connect with members through their sponsorship of the “Hole in One” contest in both Nebraska and Iowa as they continue to build a presence there”, according to Cody Nuernberg, president of NLA. LBM Advantage’s Steve Houle was recognized at this same event with the 2019 President’s Award for his “long time support of the Association, dating back to his owner position with Bob’s Building Center in Baxter, Minn., to his role on the board of NLA, to his contributions with our members as a member sales manager of LBM Advantage,” Nuernberg stated.